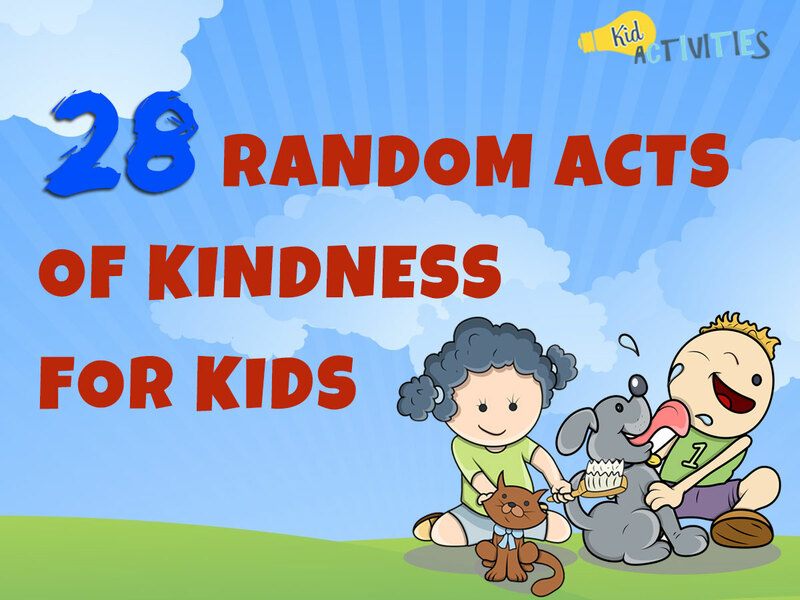 Check out these 28 random acts of kindness for kids! These kindness ideas will help your kids learn to be kind and generous. “KINDNESS STARTS WITH ME! ♥ PAY IT FORWARD” A nice reminder for the room! Create a slogan and make posters and bumper stickers. Put them about the room and/or use slogans as writing and illustrating. The following ‘slogans and quotes’ would also make great posters to display in the windows of local merchants! memorize their favorite quote. They could also illustrate their favorite quote. •To laugh often and much; to win the respect of intelligent people and the affection of children…to leave the world a better place…to know even one life has breathed easier because you have lived. •Too often we underestimate the power of a touch, a smile, a kind word, a listening ear, an honest compliment, or the smallest act of caring, all of which have the potential to turn a life around. •Kindness is never wasted. If it has no effect on the recipient, at least it benefits the bestower. Use the letters of ‘KINDNESS’ to create acrostic poems. Use these poems to create a bulletin board, or use them as the written inserts of kindness cards. Put up a kindness banner or sign at the entrance to school or your room to remind people to practice Random Acts of Kindness. One school has set up a display in the entrance of their building they call it “The Kindness Zone.” In this area they have put up hearts with suggestions of what children can do to show kindness to others. ♥ Set up a board game to play with your family. ♥ Pick up another student’s jacket that has fallen on the floor. ♥ Ask a student you have never played with to join you at recess. ♥ Share your snack with a friend. ♥ Call your grandparents and tell them you love them. ♥ Sweep the kitchen floor for your parents. ♥ Take out the garbage without being asked. ♥ Pick up garbage on the schoolyard. Discuss how important it is to spread joy and it starts with them. Take pictures of students smiling. Select different students weekly that are smiling and display them in an area of the hall. Donot tell them who will be selected as “Students of Joy!” for the week. You may also have other students take pictures if you have a digital camera.” (Source: Nell Clark, Computer Teacher at teachnology.com. I thought about that smile and then I realized its worth. A single smile, just like mine, could travel around the earth. Let’s start an epidemic quick and get the world infected. 1. 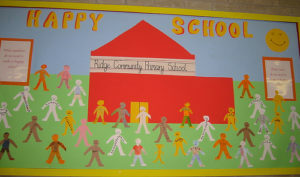 Provide each child with a small paper cutout in the shape of a human– or have students cut out their own paper figures. 2. Ask each student to write his or her name on the cutout. 3. 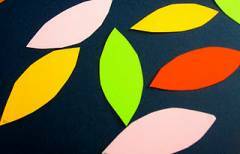 Have students form a circle; have them pass the cutouts to the person on their right. 4. As the cutouts are passed around the circle, have each person make a small crumple or tearin the cutout and add a pencil mark. 5. When the cutouts have made their way around the entire circle, have students try to repair their own cutouts by flattening, erasing, and taping. 6. After cutouts are repaired, discuss the activity. Talk about the effects of unkind words and hurt feelings. You might display the cutouts on a bulletin board as a constant reminder of the effects of hurtful actions. Ask the kids if anyone thinks they can squeeze the entire tube of paste out… and then put it back into the tube? No one will think they can…Proceed to squeeze the entire tube onto a paper plate and show how it cannot be put back in. Compare it to our words and how we treat one another. Kids will get the visual of how once we say unkind words… we can’t take them back. We can apologize but it’s still out there and has hurt our friends. This is a wonderful visual; refer back to it throughout the year. We will all be kind today! Let us all be kind today. Are you a music teacher or have a music segment in your program or center? If so…Focus on KINDNESS SONGS. They motivate…inspire…express emotions…give confidence and bring joy. •Write notes of appreciation to the cafeteria workers, janitors, or other staff members who don’t normally receive recognition. •Ask your principal if each student from your class/program can read a quote or story about kindness each morning over the intercom for as many days as there are students in your class/program. •Tell someone that they are special. •Write a letter, or for younger kids — help them write a letter to someone, telling them how much you appreciate them. •Write a letter to a friend, classmate or co-worker, highlighting their strengths. •Play “10 Good Things.” Say ten good things about someone. •Remember that words are powerful. Say something to someone that you know they want to hear — or need to hear. •Have a ‘Say Something Nice Day’! See directions below the middle of this page. Something to think about with your class/group! How long would it take to do ONE MILLION ACTS OF KINDNESS? What would it take? An act of kindness can be as easy as a friendly smile for a stranger, a kind thought for someone, holding the door for others, helping someone elderly with a routine task, letting a driver through in traffic, thanking a veteran, forgiving someone whom you felt has hurt you….. Ask the kids if they think they’ll do One Million Acts of Kindness in their lifetime? And then start! Extension: Have some math fun…If each child in your group or class did at least one act of kindness each day-how many would that be by the end of the year? 1. Label a plastic 32 ounce or larger, pretzel, milk jug, or goodie jar. With the children, decide on a donation project. Coins for the Rainforest, a Homeless or Women’s Shelter or Habitat for Humanity. 2. When the jar fills, start another. This project demonstrates that one small act- such as contributing one coin- will grow into many acts of kindness, sharing and caring. It is astonishing how quickly coins will grow into a considerable amount of money. 3. Be sure to inform and talk to the children about the activity and its importance. Tell them what it is and how this will help the cause. 4. Along the way have children guess how many coins will be collected, how many are actually in the jar or jars, how much the jar weighs, etc. Recognize the closest guesses in some way. •When your “Coins for______” is complete, be sure to submit an article to your building newsletter as well as your program newsletter! Tip: On a daily basis, place the jar in the parents/information center and also rotate it within your building’s staff lounge, office and work rooms! Inform the building community of your project and watch the coins multiply! Have staff and program children be on the lookout for RAKs throughout the week. Supply forms to nominate kids they see doing RAKs around the program or school day. • Staff members and parents can also be awarded RAKs. • The nominee’s names/acts can be posted in the information center on Friday mornings. When a child receives RAK recognition, take their photograph and put it on a construction paper brick shape. If unable to take a photo, write their name and deed on the brick and put it on the wall of kindness. Each week the kids will see the brick wall grow. A large area will be covered by the end of the school year! • Design a pre-cut person, hand, or heart shape. When children are caught being kind, take the design with their name and deed on the shape. • The shapes are taped together in a chain or patchwork style connecting the kids of the program or classroom. This is a good project for the entire school—connecting one end of the school to the other! Check it out with the school to see if they’d like to join you! Create a special ‘Kindness Section’ in your school or center newspaper–where good news about acts of kindness are reported. If there’s no school newspaper, create a classroom newspaper. Trace each child’s hand on a piece of paper. Ask children to think of different ways people can be kind to others. Write their ideas on each finger of the hand drawing. It can be completed as described or cut out, mounted and decorated. Can also be put on wall or bulletin board. This game is good to play when you have a group of children, especially if they tend to have a lot of personality conflicts. Break children into groups; give each child a piece of paper. Ask them to tear it into pieces–one for each child in the group. On each piece of paper they should write the child’s name, and then list all of the positive characteristics they can think of about that child. Try to have them focus on personality traits and behaviors, not physical attributes. When each child has completed their lists, they should put all of them into a box. An adult in the group can read aloud all of the positive comments about each child. The children are usually very surprised at how many great things are said about them. If they would like, the children can keep their lists in a folder or notebook. Then, when they’re feeling a little down about themselves, they can read about how wonderful other people think they are. 18. THANKS FOR THE COMPLIMENT! Everyone gets a piece of paper taped to their back. (Make sure their name is at the top of the paper.) Each person is given a marker. Each person in the group must walk around the room and write a compliment or positive remark about that person on their back….. NO PEEKING! What a great self-esteem booster. It doesn’t matter if the group knows each other well— because you can say things like…”He seems friendly” etc. But this is a great activity to do with kids who have been in a group for a while. The Random Acts of Kindness Foundation inspires people to practice kindness and to “pass it on” to others. They provide free educational and community ideas, guidance, and other resources to kindness participants through the website. 1. Bookmarks showing ‘ten great ideas’ for doing kindness every day. 2. Ten (More) Ideas For Kindness. 3. ‘Kindness Pass It On’ … a sheet of bookmarks that you can print out and give to whoever needs a fun reminder about doing kindness. This is a club for third through eighth graders. The club is based on service learning and community service. Through this process, responsible youth will make the club successful. • The kids in the club brainstorm some service learning projects, and then implement their ideas. • A contract must be signed as a promise of commitment. • The children deliver the items that the program produces to the people in need Example: pictures to senior homes, etc. • Participating children can receive special things for being in the club. An idea is a badge similar to ‘security badges’ that staff wear, or a special certificate. • Also arrange special surprises. In October, one program had a local farm donate small pumpkins for all the students in the RAK Club. This demonstrates the receiving end of a random act of kindness! • Recognize the members of this club at a school assembly or event at the end of the school year. 1. Youth brainstorm ideas for unexpected, kind things to do for people–people who would not expect children to do a favor/kindness for them. 2. Each idea is put on a shape and put on the board. 3. When a student completes a RAK, they sign their name on the act that is posted on the board. 4. By the end of the year, hopefully all of the brainstormed acts will have at least one signature on them to signify that someone acted in that manner for someone. To increase RAK and morale between your program and host staff, consider an RAK for them. • One morning provide a surprise pastry, donut, cookies or fruit table in the lounge. • Have the children make cards to put on the teachers room doors announcing the random surprise! Have SAC children volunteer to carry teacher’s books, boxes, backpacks, etc. when needed without being asked by the teacher. • Chocolate Kisses to remind you that you are loved! • Starbursts to give you a burst of energy on the days you’re low! • A Lifesaver for you in return for all the times you’ve rescued us! • A “thank you” for all the laughs and Snickers you share! • And most importantly, smiles to pass on! On your “Say Something Nice Day’ notice something you like about a person and tell them. This can be during a ‘Kindness Day or Week’–or ANY time of the year! When you are back together at the end of the day, share your experiences. Most kids easily understand “act” and “kindness” but might be unfamiliar with “random”. Helping them define and learn to use this word is crucial to understanding the phrase. Explain Random Acts of Kindness. You can do this by reading or telling children Random Acts of Kindness stories to get them to fully understand the concept. • Make a birdbath from a plastic dish and put it in your yard or on the windowsill. Keep it filled with water. • Maintain water bowls during cold months for both migrating and local birds. Make birdseed available as well. • Notify authorities immediately about pets left in hot cars. You may save a life. • Talk to younger children about why catching wild creatures such as frogs and turtles is not a good idea. Remind them that wild animals need to stay wild and free. • Offer to wash your dog or a neighbor’s dog. • Make nutritional treats for dogs and cats, and give them to neighbors for their pets. Make extra for animal shelters. • Adopt a lion, tiger, whale, or other animal. Many zoos, aquariums, and animal sea habitats have adoption programs. In exchange for financial support, you get a photo and biography of your new adoptee. 25. SPREAD KINDNESS IN YOUR NEIGHBORHOOD! The students at Franklin Elementary in Little Rock, all made cards with ‘original kind sayings’. On February 14th the students and staff delivered the cards and small gift bags to neighbors surrounding our school. The students LOVE sharing with others! We received very nice responses from the neighbors. This is only one of the community projects that we have been involved with this year. WE LOVE PAYING IT FORWARD!!! The staff started these activities realizing that when children learn to share, it can be contagious and encourage them toward becoming better human beings who ENJOY being kind to others. From Laura~ At the After Care Program I run, we have a RANDOM ACT OF KINDNESS CHAIN. A link is addded every time a random act of kindness is witnessed (The loops are made out of construction paper). We then send a coupon home that says “Be proud of your child, they have performed a random act of kindness today!” The kids love it! Each year we try to beat the previous year. We hang the chain around the room. Near Thanksgiving, make a huge turkey body out of construction paper and affix it to a wall. Give kids multi-colored paper feathers (construction paper, and write something nice about other students or family members. Collect the feathers and place on the turkey. 1. Challenge children to do random acts of kindness for others for one day. 2. Advertise, post info, and make a big deal about the day!. 3. Tell youth that they are not to reveal that they have done these nice things and if someone should ask them, “Did you put away the dishes…or games..or whatever…”? They reply, “Must have been a good elf”. This activity helps children realize we don’t always have to be recognized when we do something for someone else. If playing with preschoolers or kindergarteners, you may want to send a note home explaining how parents can help. I can’t remember where I first saw this, but we do it every year! Cassie/Mi. Make a large poster in the shape of the number 100 to hang in your classroom/program area. SEVERAL WEEKS before the 100th day of school, discuss acts of kindness toward others. Based on the number of youth in your group, two to three weeks before the big day, announce open season on acts of kindness. Encourage the children to recognize acts of kindness by others. Each time kids see a classmate or friend engage in an act of kindness, they will tell staff and then put a sticker and their friend’s name on the poster. The students can NOT name themselves, only others. It should be easy to reach the goal of 100 acts of kindness. A profound difference in behavior, relationships, and outlook will be noticed. Collect 100 hugs. Keep track on them on a chart. 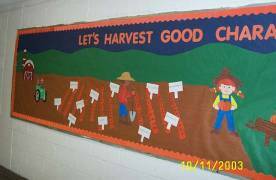 This idea works well with a Fall Harvest Theme but also addresses Aniti-Bully Week in October and World Kindness Week in November. This board was created by Barbara Huttle for University Christian School. Thank you Barbara for letting KIdActivities display your wonderful idea! This ‘Acts of Kindness” Display was created by Katja Van Elbe at a week long “Conscious Discipline Institute”workshop. To replicate this idea, after making the tree shape of trunk and branches–add a heart for every kindness act noted. This idea is nice any time of the year, but works especially well in the month of February. February not only celebrates National Kindness Week, but also Valentine’s Day and International Friendship Month! On a wall, have children/staff make a HUGE GUMBALL MACHINE. 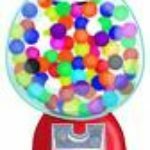 Children’s names combined with their act of ‘kindness’ are recorded on large gumballs and then placed on the gumball globe. When the machine is filled- celebrate with the group for achieving your goal! Great idea! Your own version of a GRAFFITI WALL! 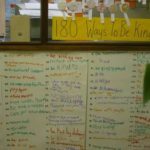 The 180 Ways to Be Kind photograph is courtesy of Classroom Display Blog Put up a large sheet of paper and title. Challenge children to come up with ‘180 ways’ to be kind to each other, teachers, parents, friends, siblings and community in general! (180 is just an idea-it could be 175, 200, etc.) If you have an after-school program, consider opening it to the entire school! Additionally, the ‘100th Day of School’ falls about the same time in February as ‘Random Acts of Kindness Week’! Consider combining the Graffiti Wall with 100 ways to be kind and celebrate both! The staff at Colchester Institute Library (UK) put together this “Wall of Lurve” (You can call it Wall of ‘Kindness’ ‘Friendship’, or ‘______’.) The library staff provided a display for students and staff to write messages. Around 150 pink hearts were displayed on the Wall at the entrance to the library. 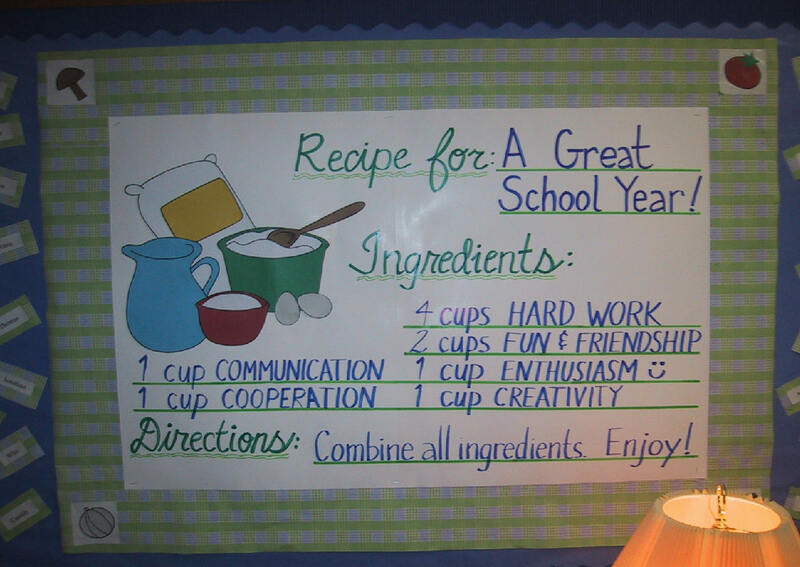 This is something that could easily be adapted to a class or after-school program! The hearts could be filled with Acts of Kindness November’s World Kindness Day and Week as well as February’s Random Acts of Kindness Week! A really nice idea to cover Valentine’s Day, Friendship Month and Kindness Week all in one! WIN BOOKS through ACTS OF KINDNESS! Tim Anders (Dr. Hope) and Alpine Publishing Inc., is offering FREE award winning, bilingual (English and Spanish) children’s books by Tim Anders. An ENTIRE elementary school class, group, or organization can win books through an “Act of Kindness” contest. Children are encouraged to perform acts of kindness for their community, individuals and each other. 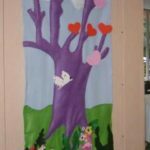 This contest hopes to inspire elementary school children and their parents to help those in need–as well as teach compassion and love for others. For more info about the “Act of Kindness” contest books, please visit laughingday! Stop negative comments by changing the subject when someone starts talking in a negative, bad way. When you meet someone, learn their name and one personal thing about them. This shows people ‘we care’. When you have good service somewhere, write a letter to the company and that person’s manager, telling them about their outstanding employee. Put something you no longer need on craigslist.com for free. Listen to someone who needs to talk. Just listen to them. Do something nice for someone when they are ill –wash their dishes, cook a meal or tidy up their house. Buy a phone card and give it to a homeless shelter for them to give to someone. Bake cookies and take them to someone who is homebound. Leave a book you have already finished somewhere for someone else to read. Leave a note in it for them to pass it on. Send a card to someone in the military overseas. Locate a family that is struggling financially and buy each member several small gifts then have it delivered while you remain anonymous. If you’re tall and see someone trying to get something on a super market/store shelf–that is out of reach–get it for them. When shooping–let someone go ahead of you in the checkout line. Read to a child…..Make a wish come true…..Rake someone’s yard…..Smile at a stranger…..Be a courteous driver…..Help Special Olympics…..Sing a song…..Pick up litter…..Train Seeing Eye dogs…..Tutor immigrants……Be a pen pal…..Hold a door open…..Change a tire…..Adopt-a-Highway…..Organize a neighborhood watch…..Teach peer mediation…..Tell a joke…..Sub for Santa…..Start a community garden……Be a Crisis-Line volunteer……Send a thank you note…..Give clothes at a shelter…..Tend abused children…..Wash a car…..Visit a lemonade stand…..Plant a tree…..Recycle…..Visit a sick neighbor…..Give a tip…..Volunteer. WHEN YOU THOUGHT I WASN’T LOOKING, I saw you hang my first painting on the refrigerator and I immediately wanted to paint another one. When you thought I wasn’t looking, I saw you feed a stray cat and I learned that it was good to be kind to animals. When you thought I wasn’t looking, I saw you make a meal and take it to a friend who was sick and I learned that we all have to help take care of each other. When you thought I wasn’t looking, I saw you take care of our house and everyone in it and I learned we have to take care of what we are given. When you thought I wasn’t looking, I saw how you handled your responsibilities, even when you didn’t feel good and I learned that I would have to be responsible when I grow up. When you thought I wasn’t looking, I saw tears come from your eyes and I learned that sometimes things hurt, but it’s all right to cry. When you thought I wasn’t looking I looked at you and wanted to say, ‘Thanks for all the things I saw when you thought I wasn’t looking. When you incorporate ‘Random Acts of Kindness and Community Service’ into your programs, homes, and classrooms, consider not basing the activity where children receive individual PRIZES AS AN INCENTIVE. However, do set goals and celebrate as a group (family) when goals are acheived! We want children to do nice things–because it is helpful to others and feels good! Don’t offer bribes, or bargain for good works. For example: “If you do this—I’ll give you____”. These practices don’t build character, or a sense of program/family community. 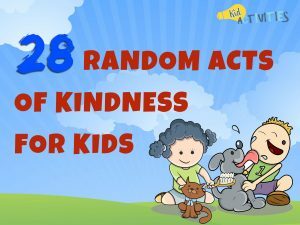 There you have it, 28 random acts of kindness for kids. I hope you have enjoyed the list and will put them into practice. Looking for some more heartfelt ideas? Check out our list of community service ideas for kids.